Play music on your sound system using any Bluetooth enabled device, including your smartphone, tablet, or computer with the Bluetooth Audio Receiver. 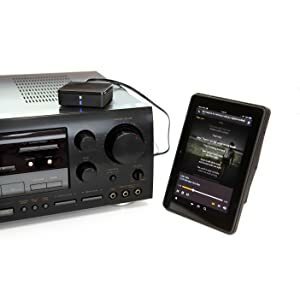 This audio receiver allows you to stream music directly from your Bluetooth device and connect wirelessly to any receiver with an auxiliary input from up to 30 feet away using Bluetooth 4.0 technology. The device is always on when plugged in, so just connect and play. 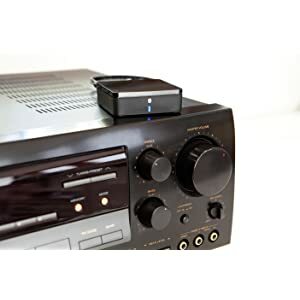 The Bluetooth Audio Receiver should be plugged into your speakers or amplifier. Sound quality will diminish when plugged into headphones. 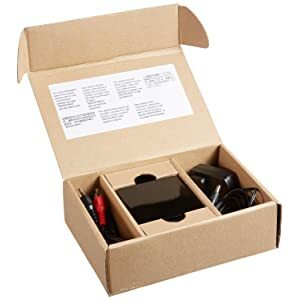 The receiver connects to your home stereo or speakers using the included RCA to 3.5mm audio cable and the power adapter connects to your standard wall outlet. 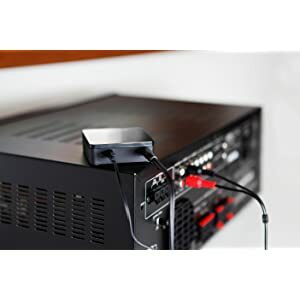 Connect wirelessly to the Audio Receiver via your Bluetooth enabled device such as iPhone, iPad, Kindle Fire, or Samsung Galaxy phone or tablet from up to 30 feet away. Giving you the freedom to move around and stay connected. Listen to your favorite music stored on your device or from online radio apps. This product is backed by a 1-year limited warranty.